I still remember when our son was born and we started to leave the hospital. There were pamphlets, how-to guides. nurses visits, home visits, everything to help us care for our child's physical and mental well being in those foundational and sleep deprived early days. Yet, as our little one grew I found it difficult to find a durable, accessible, and child-friendly source to help introduce our son to matters of faith and the heart. Although the market is full of books for bedtime full of familiar Bible stories I struggled to find one that was suitable colourful with age-appropriate story length and durable enough to handle my son's love of books (we're not rough we just love our books). I was thrilled for the chance to review Words to Dream On and hopeful my hunt may have found a match. When our new book first arrived I was instantly caught by the beautiful illustrations throughout the book and it's front cover. I love that the pictures reflect the story to help our son engage the story as we still work to help him gain some verbal skills. Pictures can sometimes be overlooked for importance but as I watch our son engage visually I'm beginning to realize how crucial a strong image can be for our little man. The second thing I noticed was the binding. Some books you pick up and they go straight on the shelf, they're the type that extra care is required. Words to Dream On, however, has a nice thick cover and binding which I had no problem handing over to my 21 month old to explore and begin discovering right out of the box! I love that this will easily be around for many years of bedtime stories. The third thing we all noticed were the stories. After years of volunteering and a Bible College degree I often get annoyed by children's stories that paraphrase and "dumb down" to the point that you're left with only moral thoughts and nice feelings (yes, sadly they exist). On the other hand, I'm equally discouraged by children's stories that are so long a child loses interest (training up a child I'm convinced also includes attention spans). Stortz offers a perfect compromise though with a 3-4 page average story that includes pictures, a bedtime prayer, the actual scripture reference (so mom and dad or older siblings can follow along at their own level afterwards) and a short blessing to tie things together. While the stories themselves are somewhat paraphrased, they've been true to the story and child accessible to the point that when #2 arrives this summer I know that the age gap won't be an issue for both of them enjoying this book for at least a few years. Finally, I really appreciated the order of this book. Chronological in nature, families can choose to read through in order building upon the narrative and seeing how God's story unfolds over time or families can use the handy index to find stories that more closely connect to real life or family devotionals that may already be underway. 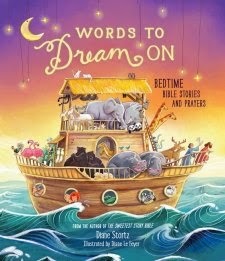 Finding a good collection of Bible stories can be difficult in today's market but if you're looking for a book that is durable, engaging, and will appeal to multiple family members I highly recommend giving Words to Dream On a second look!